Home » Plays » Off-Broadway » Awake and Sing! In the 1930’s playwright Clifford Odets was the voice of struggling, Depression era working stiffs, Jews his main focus. His Waiting for Lefty, Rocket to the Moon and Awake and Sing! brought the Group Theater, that harbinger of method acting, international attention and spawned an entire school of naturalistic acting. Awake and Sing! seems at first an odd choice for NAATCO, the acting company dedicated to the advancement of Asian actors, but after an initial wary uneasiness, the cast, under the direction of Stephen Brown-Fried, soon takes command of Odets’ dated language, a mixture of poetic metaphor and heightened colloquialisms which was difficult to speak even in the 1930’s. Awake and Sing! takes us to the Depression era Bronx apartment of the extended Berger family, a distinctly New York Jewish brood, presided over by the resolute matriarch Bessie (Mia Katigbak). The Bergers seem to be slightly better off than most families in their neighborhood where reports of evictions are the routine subject of dinner discussions. 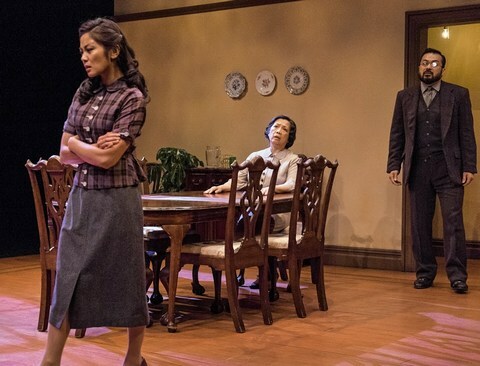 Bessie’s meek husband, Myron (Henry Yuk) keeps chiming in with inanities while their love-starved son Ralph (Jon Norman Schneider) and daughter Hennie (Teresa Avia Lim) find only dreariness in their lives. Hennie gets herself “in trouble” and is married off to a convenient beau, the schlemiel Sam Feinschreiber (David Shih), while the man who made love to her and got her pregnant, the arrogant, macho Moe Axelrod (Sanjit De Silva) winds up boarding chez Berger, making for a tense atmosphere. Constantly being in the presence of Max’s sexual allure makes Hennie’s life miserable. Bessie’s successful brother, Morty (James Saito), appears in the second act as the voice of capitalistic success. The elderly Jacob (Alok Tewari), Bessie’s left-wing, idealistic, opera-loving father, disturbed by how low his life has taken him and bothered by his strident daughter’s machinations, makes a decision that turns the household upside-down. Aside from trying to find what is universal in Odets’ message of hope amidst chaos, this play gives ample opportunity for the actors to let loose with a full spectrum of emotion. 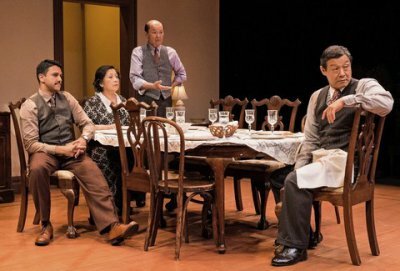 The elephant in the room was, of course, whether Asian actors, particularly the young ones, communicate what it was like to be a struggling Jewish family in the Depression. The result is mixed. NAATCO’s actors clearly understand this teaming world, a microcosm in a stuffy, crowded apartment. They are still not totally at ease with the language. To be fair, even an all-Jewish cast would find these lines difficult to inhabit. They work hard at being in that time and place, wearing Alexae Visel’s costumes well. Although the clothing should have had a more lived-in feel, they were well chosen. They occupy Anshuman Bhatia’s period-perfect set convincingly. The details, such as the carefully chosen dishes and tchotchkes are wonderful. Ms. Katigbak has the furor of Bessie, but needs to reveal how she got to be de facto head of the family. The two young actors, Mr. Schneider and Ms. Lim, convey their emotions well, but their physicality is too modern. Mr. Yuk’s Myron needn’t be so passive; an occasional spark of what attracted Bessie to him would deepen his interpretation. Mr. De Silva’s Moe is, perhaps, too laid back, but he communicates his conflicting emotions—the macho, the tenderness, the anger—clearly. Mr. Saito’s Uncle Morty lacks the glib self-centeredness that made him such a successful businessman. He comes across a tad colorless. David Shih’s Sam is far too glum. His plodding walk is a bit overstated. Mr. Tewari’s Jacob hits almost every note. The way he glares at his flatmates is a study in itself. In two tiny roles, Mel Duane Gionson as the janitor and Lulu as the beloved pet dog, Tootsie, make good impressions. Exquisite musical adaptation of the 2007 Israeli film by David Yazbek and Itamar Moses has wonderfully subtle performances by Tony Shalhoub and Katrina Lenk.